A Columbus Ohio Child Custody Attorney article about your right to obtain school or medical records and information about your child. This is a complaint that family law attorneys hear often, regardless of whether parents live across the street from each other or across the country. In Ohio, unless a court finds it is not in the child’s best interest for reasons such as domestic violence, both the residential and non-residential parent are entitled to school, medical and day care records access. This is true whether you have visitation only, shared parenting, or sole custody. This means you have the RIGHT to receive those documents. Ohio Revised Code 3109.051(H)(1) provides a parent of a child who is not the residential parent of the child is entitled to access to their child’s records “under the same terms and conditions under which access is provided to the residential parent“. This applies to ANY record which applies to the child and would be available to the residential parent. PARENTAL review of the records is prevented by other laws regarding confidentiality, privilege or privacy (hint, make them state which law, because it might not exist, or might not apply – may be just a stonewalling technique). Ohio Revised Code 3109.051(H)(2) provides the authority for enforcement of your records access rights. If you present the keeper of any record with a copy of your court order which allows you access to your child’s records, and the record is not excluded by your court order, or by a valid law, then you are allowed to review the record. If the record keeper prevents you from doing so, pursuant to ORC 3109.051(H)(2), that record is in contempt of court. Note, the law does NOT require a certified copy of your order. 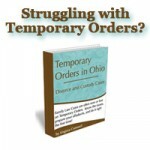 As with any parenting order, the record keeper is required to obey the court’s MOST RECENT order, so if a previous order prohibited you from getting the records, but your current order does not, then the record keeper must, by law, give you the access to which you are legally entitled. Do you have access to a telephone? Can you call your child’s school? Can you mail a copy of your court order to your child’s school and ask that it be placed in your child’s file? Have you ever read your court order – or are you relying on your ex, friend, family or neighbor to tell you what the law is? If your child’s school will only mail the report cards to one parent, show them the court order that tells them you are entitled to access to your child’s records and give them postage pre-paid envelopes so that they can mail you additional copies of your child’s records and notices. Are you willing to do this? If your child’s school places report cards online, and your ex keeps changing the password – Why don’t you go to the school to obtain a copy – it’s cheaper than hiring a lawyer. Have you made any effort to get the child’s soccer schedule from the soccer coach directly? Perhaps if you gave the coach your e-mail or mailing address, you would receive all notices in a timely fashion. The bottom line is many people are so focused in the playing the game that their ex has started, they go YEARS without having information about their child that they are entitled to. Don’t be a victim, and don’t waste your energy trying to make your ex do the right thing. Your ex is probably enjoying this little game immensely and you are helping them! So pick up the phone, your mouse or your car keys and fix the problem! A judge is going to ask you why you didn’t pick up the phone, the mouse or the car keys before you hired a lawyer and requested a trial – “Because I shouldn’t have to.” is not going to impress the judge. He or she is going to expect you to engage in a little self-help in this matter before going to court. I like where you went with the whole, “Are your arms broken?” thing. BUT, we aren’t all TRYING to keep that information from them. All we are doing is saying is, “Are your arms broken?” It is NOT my job to make sure YOU are being a parent to your child. I’ve got enough on my plate making sure I am being a parent to my child. Now, I have to make sure your grown arse is doing it, too? Um. No. You want to know? Ask. I’ll be happy to tell you. Or, as this article explains, Go BE A FATHER, and get that info yourself. I had to. So, now you do the same! But, when you don’t ask for that information, from either me or the school, Do NOT cry victim because even God only helps those who help themselves! I have shared parenting with my ex and she currently has medical insurance on my children and refuses to give me copies of the insurance cards what can I do ?